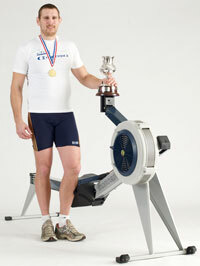 This Year saw the 19th British Indoor Rowing Championships held at the National Indoor Arena, Birmingham. It is the world’s biggest indoor rowing race and the largest indoor sporting event in the UK where competitors race 2000m in the quickest possible time. Four members of Durham Amateur Rowing Club travelled to Birmingham to compete on Sunday 22nd November. Gill Prescott won gold in the Women’s 50-54 event in a time of 7.20.2. This is the fourth successive year that Gill has won the British title which she can add to her wins in the British, Scottish, European and World Championships in 2007 and the British, Scottish, North East and World Championships in 2008. Garath Archer, a former International rugby player, was competing in the championships this weekend. He won gold in a time of 5:51.1 in the Mens Open Hwt event, matching time only the Concept 2 British Indoor record currently held by Sir Steve Redgrave in the 35-39 event set in 1998. Gareth came in 4/100 of a second faster than Silver Medallist Cameron Nichol from GB Rowing and 1.7 seconds faster than Bronze Medallist Steve Rowbotham, also GB Rowing. This was an exceptional win for Gareth in his second year at the National indoor event. Both Gareth and Gill are coached by Durham ARC Geoff Graham. Roger Stainforth, a successful veteran competitor at the indoor rowing events won Bronze in the Men 65-69 Hwt category with a time of 7:04.8. Toria Lloyd in her first year at the event finished 6th out of nine in the Women 35-39 Hwt category. This entry was posted in Racing News on November 23, 2009 by admin.